EPA 22 MPG Hwy/16 MPG City! CARFAX 1-Owner. 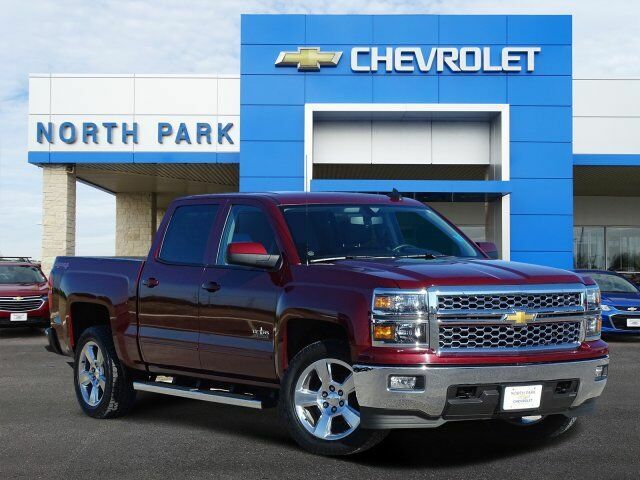 Hitch, TRAILERING PACKAGE, BOSE SOUND WITH 6 SPEAKER SYSTEM, Onboard Communications System, 4x4, Chrome Wheels, TEXAS EDITION, 1LT TRIM, CHEVROLET MYLINK AUDIO SYSTEM, 8" DIA... READ MORE! TEXAS EDITION, 1LT TRIM includes Texas Edition badging and 20" wheels (Includes (Z82) Trailering Package, (G80) locking differential and (RD4) 20" x 9" polished-aluminum wheels. LT CONVENIENCE PACKAGE includes (AG1) driver 10-way power seat adjuster with (AZ3) bench seats, (CJ2) dual-zone climate control, (BTV) Remote Vehicle Starter system, (IO5) MyLink 8" Diagonal Color Touch audio system, (UVC) Rear Vision Camera, (C49) rear-window defogger and (KI4) 110-volt power outlet (Includes (T3U) front fog lamps. (N37) manual tilt and telescopic steering column included with (L83) 5.3L EcoTec3 V8 engine. ), ENGINE, 5.3L ECOTEC3 V8 WITH ACTIVE FUEL MANAGEMENT, DIRECT INJECTION AND VARIABLE VALVE TIMING includes aluminum block construction (355 hp [265 kW] @ 5600 rpm, 383 lb-ft of torque [518 Nm] @ 4100 rpm; more than 300 lb-ft of torque from 2000 to 5600 rpm), TRAILERING PACKAGE includes trailer hitch, 7-pin and 4-pin connectors (Includes (G80) locking rear differential. Keyless Entry, Privacy Glass, Steering Wheel Controls, Heated Mirrors, Electronic Stability Control, 4-Wheel ABS, Tire Pressure Monitoring System. TEXAS EDITION, 1LT TRIM includes Texas Edition badging and 20" wheels (Includes (Z82) Trailering Package, (G80) locking differential and (RD4) 20" x 9" polished-aluminum wheels.